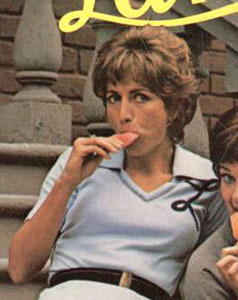 Penny Marshall played Laverne DeFazio, usually wearing an 'L' on her sweater, on TV's Laverne and Shirley. She has also had success as a director (Big, Awakenings) and producer (Cinderella Man, the big-screen Bewitched). Her mother frequently criticized Penny’s appearance, which has been called simultaneously cute and plain. Marshall is also known for her distinctive voice, a nasal whine with an authentic Bronx accent. Early in her career, she appeared in a Head & Shoulders commercial, where she was the plain girl with dandruff, and future pin-up girl Farrah Fawcett played the beautiful, flake-free girl. Marshall studied math and psychology in college, but dropped out during her junior year upon her pregnancy. She married the baby's father, Mike Henry, but they divorced a few years later. Following the divorce, Marshall worked at a low-paying job as a secretary until her brother, Hollywood writer-producer Garry Marshall, landed her a small part in the James Garner-Debbie Reynolds comedy How Sweet It Is. Marshall became best friends with Reynolds' daughter, Carrie Fisher, and the two actresses have shared a joint birthday party in October for more than 25 years. Her brother recommended Marshall for her breakthrough role, playing Jack Klugman's secretary Myrna on The Odd Couple. And as executive producer, Garry Marshall thought his kid sister would be perfect as one of the "fast girls" opposite Henry Winkler and Ron Howard in a 1974 episode of Happy Days. Her brother was correct, and the girls were such a hit that Laverne and Shirley became the first Happy Days spin-off, with Cindy Williams as Shirley. The "fast girls" were slowed down a bit for their own series. Shirley slept with her stuffed cat, while Laverne (Marshall) was a loud whiner. The show was a huge success (though often painful to watch), but Marshall has sometimes said she did not feel she had earned it, because of all the strings pulled by her brother. Co-star Williams walked off the set in 1976, when she thought Marshall was getting all the best lines, and two writers were fired. The studio hired flunkies with stopwatches to make sure the two stars got equal screen time. Marshall married actor Rob Reiner in 1971, and during the late 1970s they went through a bitter divorce, and she began suffering severe anxiety attacks. Laverne & Shirley started to slump in the ratings, and the tension between the two actresses rose again. Williams finally quit when the show's producers (including Marshall's brother) refused to write her pregnancy into the plot. Sans Shirley, the program limped along briefly before it was canceled, but the two actresses now downplay any unpleasantness on the set, and have appeared together on reunion shows. Marshall first stepped behind the camera to direct some episodes of Laverne & Shirley. She directed her first feature film when another director was fired from Whoopi Goldberg's Jumpin' Jack Flash, and Marshall's first hit as a director was the charming Big, with Tom Hanks. After Big, she directed the dramatic Awakenings with Robert De Niro and Robin Williams, while Hanks' career nose-dived with several flops. Marshall brought Hanks back for A League of Their Own, as baseball coach to Geena Davis, Madonna, Rosie O'Donnell, and Marshall's daughter, Tracy Reiner, who played left field. Marshall required each actress to audition -- as a ballplayer -- before hiring them. Of Hanks, she said, "I brought him back; now he's a king". Marshall had been considered for the role of Gloria (played by Sally Struthers) on All in the Family, when she was dating Reiner, who played Meathead. Returning to an earlier time, Marshall again played Oscar's secretary in the 1993 TV movie, The Odd Couple: Together Again. She also voiced Laverne in the cartoons Laverne & Shirley in the Army and The Mork & Mindy/Laverne & Shirley with the Fonz Show, and she participated in Laverne & Shirley reunions in 1995, 2001, and 2002.